Fifa have been completely outwitted by Kulula's advertising genius. 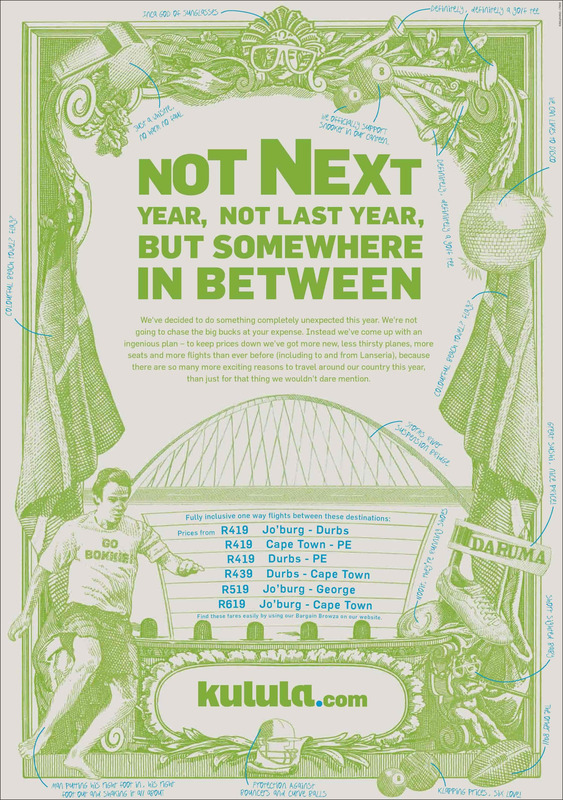 In March 2010 Fifa's lawyers lost their sense of humour and ordered Kulula to withdraw the following ad as it used words/images indicating ’soccer’, ‘South Africa’, ‘vuvuzela’, etc.., hinting at the World Cup (because you can only mention the "you-know-what"...even if you don't name it...if you deliver a sack of money to Fifa). BUT it didn't end there - read on to see Kulula's fabulous response. And here's Kulula's humorous and brilliant response - next to the items which resemble vuvuzelas they reassure us that it's "definitely a golf tee", they've replaced the soccer ball with a rugby ball, and next to a man faking a kick they write "man putting his right foot in, his right foot out". Next to what seems like a flag we are reassured that it's a beach towel. What Fifa don't seem to get, is that the more noise they make the more Kulula Airlines benefits. I love it and hope Fifa continues applying the letter of the law, thus generating more excitement for us viewers. 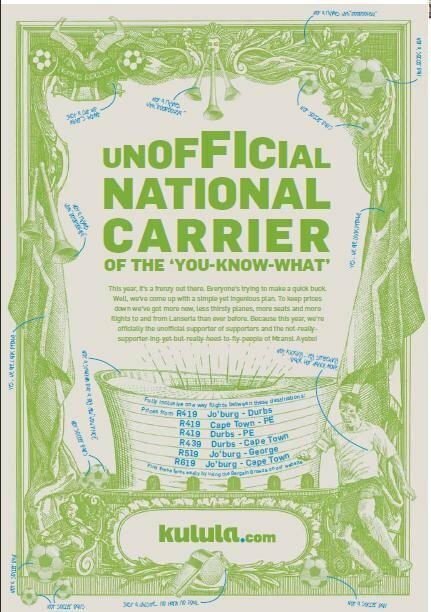 Kulula have a history of running adverts which push the limits - for instance a couple of years ago a Kulula advert was banned because they excluded airport taxes.